You are here: Home / Hoarder Homes / What is beneath the hoarding? Walking into a hoarded home comes with many unknowns. Can you reach all the rooms in the home? Did they hoard food, animals or human waste? Are all the parts to the home still functional? With these questions you have to ask yourself what is beneath the hoarding? 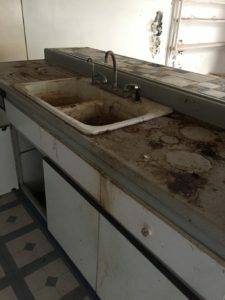 Kitchen sink in North Hollywood, CA after the hoarding is taken out. In many hoarding situations there are parts of the home that have become inaccessible. When a part of a home has not been accessed in many years there really could be anything going on in those rooms. We have seen open and broken windows that cause massive amounts of water damage from years of being open to the outside elements. Maybe the vines and overgrown yard have grown right into the side of the home and have started to take over. The bathroom shower may have been slowly leaking for years but the only signs of it have been in the bedroom that no one has been in for years. All these circumstances lead to damage on the home itself. Removing the items that have been hoarded for years does not make the home livable. Over time the items in a hoarding situation eat away at the home itself. The carpet pad melts into the sub-flooring underneath, the walls become permanently stained and smells have permeated the house itself. Homes that are hoarded not only need many hours to clean them out but they need time and money to get them back to the state that they are safe to live in or sell. When you’re in this kind of situation, its really important to get the proper pest control for your area. If you’re in los angeles, termite control los angeles is worth a look. A friend recommended them too me and he told me they do a great job. Stove in a hoarded kitchen in Bellflower, CA that had not been used in a long time. In many instances people hoard food, animals and human waste along with other items. These are things that end up making the home completely unlivable from a health standpoint. The smell soaks into every inch of porous material that it can. Food leaks and rots away in the kitchen with piles of items stacked near it. If there are animals on the property they defecate where they find room. Maybe years without having a usable bathroom cause the person suffering from hoarding to store their waste in other ways. 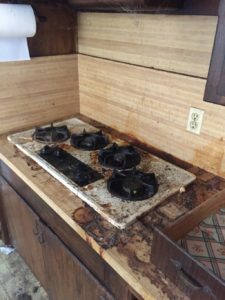 These instances all leave a home in an uninhabitable state even after the hoarded items are removed. 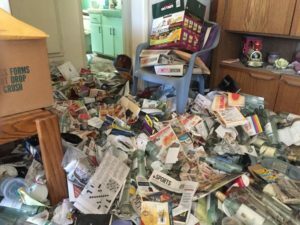 Hoarding also can cause issues with pests. Rodents, fleas, bees, bed bugs, roaches and spiders are some of the more common pests found in hoarding situations. Even without the items in the home the pests stick around. The food items and easy hiding places give rodents easy places to hide and lots to eat. Rodents cause damage to the home with their nests and excrement. In some cases we have seen when the animals that lived in the home are taken out their fleas stick around and the home itself is considered infested with fleas. Bees also take advantage of the home by making nests in the walls, fire places and the un-kept yards usually common with hoarded homes. With parts of the home being inaccessible spiders will also move in. Even after the hoarding is taken out the traces of these pests still remain. If pests are infesting your home, you may want to take professional action. If so, you can check out something like Des Moines pest control for a comprehensive extermination service. 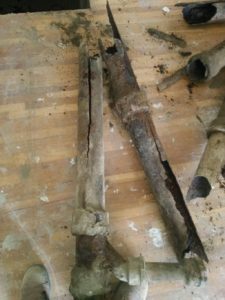 Pipes from a hoarded home in Garden Grove, CA deferred maintenance over time ate them away. Most home owners know that with owning a home comes maintenance. However people who suffer from hoarding let normal maintenance items go and they turn into large issues. We find that most of the time there are huge issues with electrical, plumbing, termites and even the foundation. Rodents have a tendency to chew through wires and everything they can in the walls of home when left alone. They can cause so much damage that the entire home needs to be rewired. In so many hoarding situations we also find that there is most likely at least one bathroom that has not been used in a long time. Either they have stopped using it because it stopped working or they have filled their bathroom so much that they cannot get into it. Beneath the hoard can be leaks and clogged pipes that cost thousands to fix. Termite issues going untreated for years can cause huge issues with the structural soundness of the home. Although foundation issues are not directly associated with hoarding they can be common. The easiest way to figure out if a home has foundation issues is by looking for cracks. In a hoarding situation cracks in the walls and other large mechanical issues can be hidden behind the hoarded items. So one of the biggest questions is what is beneath the hoard? Well, there are many unknowns when a home is filled with items due to hoarding. The items they hoard and the amount of time a home is hoarded play huge roles. The work does not end when the hoarded items are removed. What is left is a home in need of tender love and care.